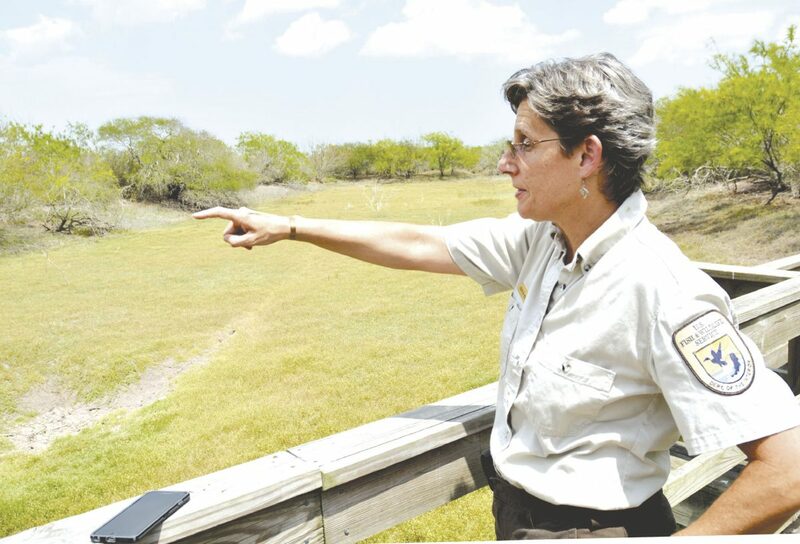 Marion Mason, lead ranger at Laguna Atascosa National Wildlife Refuge, points to a spot on Alligator Pond. The dessicated pond doesn't hold any gators these days. They've presumably moved to the big lake about 150 feet away. LOS FRESNOS — The parched and dusty mud wallows at the Alligator Pond are telling clues as to what cratered the local gator real estate market. And this isn’t the only pond or lake at Laguna Atascosa National Wildlife Refuge now barren and abandoned. All but one have gone white-bone dry. “We’ve got an alligator that’s taken up residence in an old livestock trough because there are no big areas of water left, and most of the water on our refuge has dried up except the big lake,” Marion Mason, lead ranger at the wildlife refuge, said last week. The unusually hot winter and spring weather in the Lower Rio Grande Valley, which set heat records, continues to plod onward, accompanied by an unusually dry year to date. Brownsville has recorded just 4.04 inches of rain this year, more than three inches below its average. Harlingen is down about 2.5 inches this year and McAllen is about 1.2 inches of pre-cipitation below its average. The numbers are beginning to hint of a repeat of the serious drought year of 2013, when a lack of rainfall was a significant burden to municipal water systems, farmers and gardeners, and uncomfortable for just about everybody else living in the Valley. Last week, the National Weather Service reported the U.S. Drought Monitor was categorizing parts of southern Cameron County — including where Laguna Atascosa is located — as being in severe drought conditions. The rest of the county was listed as being in moderate drought conditions, and in Hidalgo County, the weather service noted abnormally dry conditions. Don DeVriendt, fire management officer in South Texas for the U.S. Fish and Wildlife Service, is charged with protecting the refuge and other federal lands from wildfires. DeVriendt said so far high humidity has been suppressing the likelihood of wildfires in the region. Those fires, he said, can be lit by a carelessly tossed cigarette, or the hot exhaust system of a car when the driver pulls into the grass alongside a highway. Or even a car’s brakes. “A lot of times brake pads — little parts of those asbestos pads — will break off and bounce into the grass and start a fire,” DeVriendt said. He says his fire crews, although ready, haven’t been called on yet. He’s also not prepared to say 2017 is going to rival 2013 when it comes to prolonged drought in the Rio Grande Valley. But he said the Keetch-Byram Drought Index used by foresters and firefighters tasked with battling wildfires shows southern Cameron County is charting high. The index rates drought on levels of 0-200, 200-400, 400-600 and 600-800 being highest. At Laguna Atascosa, the wildlife keeps its own score. Outside the refuge’s visitor center, a small guzzler or drip pond, fed by rainfall collected in a holding tank, burbles happily away. It is a draw for great-tailed grackles taking a noisy bath, some green jays and a handful of chachalacas. But Mason said staff and visitors have been surprised at the unusual wildlife mix drawn to the refuge’s man-made water holes. “We’re seeing indigo snakes, rattlesnakes, javelinas, bobcats, coyotes and deer,” even near the visitors center, she said. The ranger also said animals have been changing their behaviors, acting differently. “Boyd (Blihovde, refuge manager) witnessed a javelina just kind of guarding one of these areas the other day, so they’re getting very territorial and protective of their resources because everything is so scarce,” Mason said. Mason said the dry conditions are responsible for a cascade effect that not everyone notices. No water means no water, whether for animal or plant. In past years, the endangered Texas subspecies of ocelot on the refuge has been adversely affected by drought conditions, at least before the guzzlers were installed. Mason said there are records of dry years when ocelot females never came into season, which meant no ocelot kittens were born. Mason says the refuge staff have put their thumbs on the scale so to speak to ensure the refuge’s 15 or so ocelots have an advantage. As she looks out over the refuge landscape and the empty ponds, Mason says it isn’t always like this.